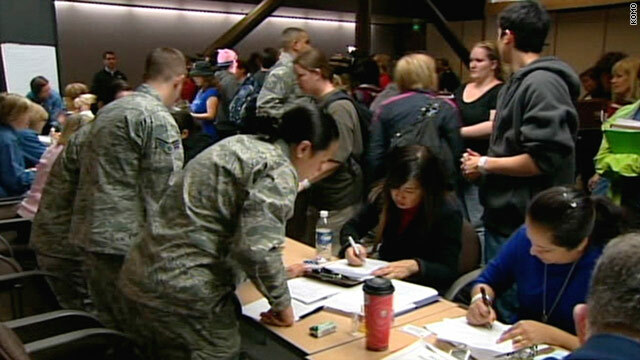 About 200 military family members arrived at Seattle-Tacoma International Airport on Saturday after leaving Japan. Washington (CNN) -- The U.S. military is continuing to evacuate family members who want to leave earthquake-ravaged Japan, according to a Pentagon spokesperson. The first group of about 230 people left Japan Saturday, Defense Department Spokeswoman Lt. Cmdr. Leslie Hull-Ryde told CNN. "We expect in the coming days for others to arrive" back to the United States, she said. On Monday, a flight carrying 154 military family members left Japan for Seattle/Tacoma International Airport in Seattle, according to Lt. Cmdr. Bill Lewis, a spokesman for U.S. Northern Command. The evacuations are not mandatory and are offered to eligible family members in adversely affected areas of Japan under what's called a "voluntary authorized departure" -- a formal evacuation process where family members wishing to depart a troubled area can leave at the U.S. government's expense and be taken to a designated safe haven. Evacuees are flying on commercial aircraft directly to the United States. Service members and civilian contractors will stay behind conducting humanitarian operations, Hull-Ryde said. The State Department on Thursday declared a voluntary authorized departure for families of its diplomats in Japan. According to the department, teams of consular officers continue to assist U.S. citizens at the Haneda and Narita airports. In addition to consular officers on duty in Washington, the U.S. Embassy in Tokyo and the Consulate in Nagoya are in operation around the clock. The consular section has extended its hours for emergency services to assist U.S. citizens. State Department personnel continue trying to account for U.S. citizens believed to have been in the affected area at the time of the earthquake and tsunami. Last week, the State Department launched a new "task force alert" system, giving individuals three ways to contact the department, by phone, e-mail, or sending data directly to the task force's website.